This is a very well done movie, the acting, gags, and score are just like a roller coaster. Robert McCall comes back with a vengeance! This time openly helping others and seeking revenge for his former colleague and dear friend who has been betrayed by those she trusted. A must see! Great movie. Denzel at his finest. Great plot!! Another outstanding performance by a great man, who encompasses his characters as himself. He Will move heaven and earth for his loved ones. I really enjoyed this one . A little different than the first Equalizer ,as this one was more of a prequel to the first . A good storyline and great acting by DW. Great plot! Lots of action, and a stellar performance by Denzel despite his age. I liked Denzel Washingtkn, his stellar performance. Since i am a karate master, i found that Washington gives a great job in the action part. that is why they use slow motion.i found the story line to be very weak but his acting is makes up for that.not as good as the first movie but i blame that on the first for it took us by surprise.i feel it is a must see and you be the judge. Well, I wouldn't recommend it and then I would not say don't go. Kinda what you would expect....one man action, gets everyone in fisticuffs, martial arts or shooting. Typical plot along with him helping a young teen in borderline dilemma...lots of action, killing, some twists; if you like Denzel you should go. Slower than the first Equalizer in the beginning but the plot is excellent and it picks up going into the middle after the plot becomes a little more clearer. Denzel always delivers! I loved D.Wash in EQ1 but this movie fails to live up to that caliber movie. The storyline is very long and convoluted. The movie simply tries to do too much, in an attempt to explain the backstory of how he became an Equalizer. Also, D.Wash looks old in this movie. I'm actually surprised he went the sequel route. Personally, i dont think it was a good move for him because this movie fails to deliver. And the final shoot-out scene....come on, just STUPID. Whatever. Plot is weak and actors are past their prime acting game. I would have given it 4 and a half stars but I didn't have the option. The movie kept my attention and it certainly had a plot to follow. Packed full of action, it made sense and kept me rooting for the good guy, Denzel. I anticipated being disappointed throughout the movie, but it never happened and I never fell asleep! Very entertaining and action packed! 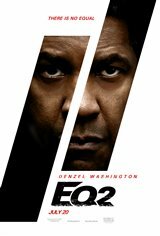 Denzel doesn't disappoint even though this movie is not as good as the first EQ. I would give this movie 3.5 stars if the website would allow me to. It's a good movie but not great. If you have so extra time for some entertainment go see it or other wise wait for it as a rental. Mission Impossible was far better of a movie. Not surprised this dropped below Mamma Mia in its second week. Denzel is so self indulgent, he's really annoying to watch onscreen. Not to mention, it's just violence for the sake of violence. There's barely a plot. Better then the first. This movie was very good to watch. I can't wait to watch it again on DVD. Better than the first Equalizer. Great hand to hand combat. A must see for anyone that likes action. Fantastic!!! Denzil Washington delivers another great performance. The story plot validates truth over lies and good over evil always wins. Go and see this one you won't be disappointed. It was a bit more layered and thought provoking then the previous. Believable mentor relationship. My husband and I really enjoyed this movie. It had a good story and lots of action. We both preffered it to the new Mission Impossible movie. Great action movie, Denzil is amazing in this movie.